3 stars: Beautifully written, but tragic and depressing. So there's a deformed hunchback named Quasimodo, who rings the bells of Notre Dame and is the ward of the archdeacon there. The archdeacon is Claude Frollo--more on him later. There is a beautiful, graceful, young, gypsy girl named Esmerelda, who dances and sings like an angel in the square down below. There's a poet and playwright named Gringoire who continually just escapes the noose, and Claude's younger brother Jehan, who is a thoroughly likeable scoundrel. We can't leave out Phoebus, the handsome, womanizing dirt-clod soldier. Did I forget anyone? Oh yes. Crazy lady in the Rat-Hole. I can't remember her name at the moment. Plus a host of lesser characters. Let's talk about Claude for a moment. Do you remember how scary he was in that animated film? Yikes! Times that by ten, and you'll have about how creepy he is in the book. 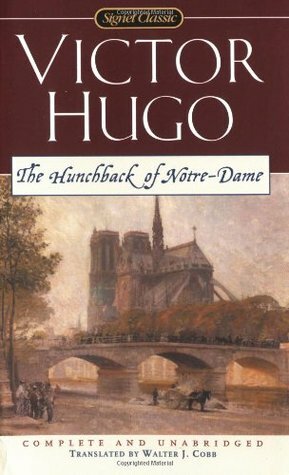 He starts off well (before the book begins), by taking care of his younger brother once they become orphans, and later on adopting Quasimodo as a squalling foundling laid on the church bench. 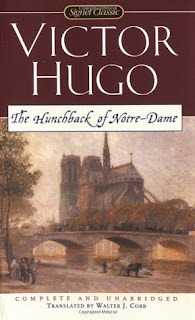 But as Hugo explains, over time he has grown bitter, disillusioned, and severe. Then he sets eyes on the enchanting Esmerelda and he is forever lost. It's a singularly unhealthy fixation. He stalks her, attempts to kidnap her (with Quasimodo's help), and just lurks. Then does something nasty and laughs about it. Yes, that really happens multiple times. Then he throws himself at her and when she refuses him, he goes even further off the deep end. Understandably, Esmerelda is terrified of him. Plus she loves handsome Phoebus, who saved her from the kidnapping attempt. Claude finds out about this one-sided affection--it is simply a dalliance to Phoebus, who is engaged to be married--and determines to destroy them both. There's a little incident with an enormous spider catching a bewildered fly that seems to sum up the entire story. Claude is convinced that he is the fly and Esmerelda the spider, while we all know that really those roles are reversed. Poor innocent Esmerelda, caught in the web of evil Claude Frollo. The web first catches Esmerelda when the priest pays for Phoebus to rent a room for a tryst with Esmerelda. Then Claude hides (with Phoebus' knowledge) up in the attic space and watches what happens. (What?!) Things don't get too far, however, before he simply can't take it anymore and throws a knife at Phoebus, hitting him in the neck and nearly killing him. Unforutnately for Esmerelda, Phoebus certainly seems dead when the policemen come, and since she's the only other one there, and also is covered in blood, she's arrested for murder. The archdeacon is long gone by that point (of course). Well, it all goes downhill from there. Way, way down. Just when you think you've hit the bottom of the pit, it all slides just a bit more for good measure. Hugo is a master of characterization. His characters are so finely drawn I feel sure I would recognize them on sight. Quasimodo, in particular, is a deeply-faceted character. Even with the abuse he has endured his whole life, he manages to love a few things deeply and even tenderly: the bells, Claude Frollo, and Esmerelda. The fact that the only two people who have ever showed him compassion are such opposites is one of the great ironies of the book. The part where Esmerelda has sanctuary in the cathedral and Quasimodo cares for her--even giving up his own pallet so she can lay on something soft, was really quite beautiful. A brief, much-needed reprieve before that train wreck of an ending. I was telling a friend about it last night, and she said, "You sound kind of traumatized." Yes, that describes it pretty well. Just don't get too attached to any of the main characters; that's all I'm saying. Although the many tangents slowed the plot down considerably, I quite enjoyed one of them. Hugo talks at length about how cathedrals were the precursor to print. Prior to Gutenberg, he argues, the only outlet for artistic endeavors was architecture, specifically cathedrals--hence the sculptors made the gargoyles, the painters the murals, and the poet, the prayers. Then along came the printing press. As a humanities major, this really caught my attention. I would like to delve into it further! I had never thought about architecture battling it out with print (and losing). Now we have the internet and social media, which may be the death of print at some point...as I type this for a blog post. What do you think? I'm not sorry I read it, but I'm definitely ready to move on to some lighter fare. Have you read it? Let's chat! There's plenty more to talk about. I completely agree that Disney had no business calling this a children's story. It isn't. But I must admit that I still like the Disney movie. The animation and music is some of the best ever, and you must agree they improved on Hugo's original story, because at least there is some sort of happy ending (they just never should've marketed it to kids). Yes, Hugo's story is rather dark and depressing, but still some brilliant writing in there (I loved the architecture-printing press connection too). I couldn't track down a copy of the movie to watch again, though I want to now that I know the actual story. :) It's been so long I don't remember much about it at all. I figured they must have done something with the ending! I think if it had been poorly written I wouldn't have even finished it. I kept reading as much for the language as for the story. I loved Les Miserables (minus the several-hundred page Napoleon detour), but haven't tried any of his others--have you?